Désolé, la version française de cette page ne peut être offerte pour le moment. A small amount of genetically modified (GM or genetically engineered) alfalfa seed was sold in Eastern Canada in 2016 and some seed is also now on the market in in the Eastern provinces. This GM alfalfa seed is sold for producing pasture and hay for farm animals, not for use as sprouting seeds. GM alfalfa is currently playing a very minimal role in the production of milk and meat products. Because alfalfa is a perennial crop pollinated by bees, GM contamination is inevitable. Contamination from genetically modified (GM) alfalfa would have serious negative impacts on many different types of farmers and farming systems, both conventional and organic. Alfalfa (hay and pasture) is high-protein feed for animals like dairy cows, beef cattle and sheep and is also used to build up nutrients in the soil, making it particularly important for organic farming of grains and vegetables. If introduced, contamination from GM alfalfa would ruin export markets for alfalfa products, and threaten the future organic food and farming in Canada. February 2017: GM alfalfa is now being advertised by seed companies in Ontario, and in dairy industry publications. Contact us if you see GM alfalfa advertised in your area. April 2016: A limited amount of GM alfalfa seed has just been sold in Eastern Canada for spring 2016 planting. The release of GM alfalfa has been delayed in Canada for three years, thanks to the protests of farmers and consumers, however the company Forage Genetics International has now rushed to put some seed on the market in Canada. We need your help to stop the company from selling another batch of seed later this year. June 19, 2017: Farm Groups Call on Ag Minister to Cancel GM Alfalfa Registration. Farm organizations have once again written to the Minister of Agriculture to repeat their joint call for the federal government to cancel variety registration for all GM alfalfa until a full economic impact assessment is conducted, and to establish testing of all imports of alfalfa seed grown in the US. April 20, 2016: Farm Groups Call on Ag Minister to Stop Genetically Modified Alfalfa Seed Release: A letter signed by 15 farm organizations calls upon the Minister of Agriculture to remove variety registration for all GM alfalfa until a full economic impact assessment is conducted, and to establish a protocol for testing all imports of alfalfa seed grown in the US. April 6, 2016: The Organic Council of Ontario has send an urgent request to the Ontario Premier to take action to appeal to the federal government to stop GM alfalfa. Read the letter here. March 24, 2016: The National Farmers Union has asked the federal Minister of Agriculture, the Honourable Lawrence MacAulay, to stop GM alfalfa seed sales. Read the letter from the NFU. 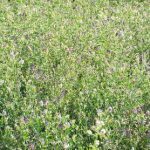 March 15, 2016: The Alberta Association Of Municipal Districts & Counties has passed a resolution to prevent genetically modified alfalfa from being introduced to the province. The resolution will be sent to the province for consideration. It asks that Alberta Agriculture and the federal government collaborate with stakeholders to prevent the introduction of genetically modified alfalfa until such a time that there is a demand for the product from Alberta’s export markets. Read more here. Individuals: Send the instant letter above asking the Minister of Agriculture and Agri-Food to cancel the approval of GM alfalfa. Farmers: Contact us with any information about GM alfalfa in your area. Is your local seed dealer selling GM alfalfa? Have you seen it advertised in any of your farm publications? Thank you for sharing information. Donate today! Your continued action and support is needed as we work to protect family farms from GM alfalfa contamination. Join us. CBAN and NFU Report, July 2013: “The Canadian Seed Trade Association’s so-called “Coexistence Plan” is a gateway to GM alfalfa contamination”, Canadian Biotechnology Action Network and National Farmers Union. Article: On the Practical Implications of Roundup Ready Alfalfa (RR®), E. Ann Clark, 2012. CBAN’s short animated video clearly explains the threat of GM alfalfa. National Farmers Union Youth: Farmer testimonials on GM alfalfa. Click here to read his comments on GE alfalfa. Press Release – National Farmers Union – March 28, 2014: Company right to not release GM alfalfa this spring, says NFU: “FGI’s decision for this year is the right decision. Even so, NFU members will continue to pressure both industry and the government to stop the release of GM alfalfa,” said Jan Slomp, NFU President and Alberta dairy farmer. “We don’t want it or need it, and we will not surrender to the interests of big seed and biotech companies” – Dave Lewington, Ontario vegetable farmer and grassfed beef producer. Read the evidence submitted to support the “Application for Review” under Ontario’s Environmental Bill of Rights. Click here to read the decision from the Ministry. Response to the GM Alfalfa petition from the Minister of Agriculture. June 10 2013: The Canadian Biotechnology Action Network (CBAN) has uncovered that the Canadian Food Inspection Agency (CFIA) has recently approved the first variety of genetically engineered alfalfa: a herbicide tolerant (Roundup Ready) alfalfa from Monsanto/Forage Genetics International. This means that one variety of GM alfalfa is now legal to sell in Canada – it is not yet on the market. We need to stop GM alfalfa seeds from being sold in Canada. The Minister of Agriculture, Gerry Ritz, chose not to intervene to stop the registration of GM alfalfa. The Minister received almost 8000 email letters asking him to stop the release GM alfalfa and on April 9, people rallied in 38 communities across Canada. Most of the community actions took place outside local constituency offices of federal Members of Parliament and many pet itions were presented to MPs that have since been presented by them in the House of Commons. Your outreach to your Members of Parliament has been very influential. As CBAN continues to implement various strategic work to stop the release of GM alfalfa, we ask you to continue your communication with your Member of Parliament. The Day of Action showed us that many MPs understand your concerns. Thank you everyone for your action on April 9, 2013 Day of Action to Stop GM Alfalfa! The Canadian Seed Trade Association (CSTA) and its corporate members including Monsanto, Pioneer and Forage Genetics International are actively trying to get support for the release of GM alfalfa. CSTA has released a “coexistence plan” for GM alfalfa to try to justify releasing the seed into the environment. However, the only way to stop contamination from GM alfalfa, is to stop GM alfalfa! Because alfalfa is a perennial plant that is pollinated by bees, genetically modified alfalfa will inevitably cross-pollinate with non-GM and organic alfalfa, threatening the livelihoods of family farmers across Canada. Prairie farmers who export alfalfa products are vocally opposed to GM alfalfa so the industry is now trying to introduce GM alfalfa in Eastern Canada first. Press Release – September 12, 2013: Industry Launches “Coexistence Plan” for GM Alfalfa as Contamination Report Investigated in the U.S.
What are Farmers Saying about GM Alfalfa? National Organic Coalition (U.S. with Canadian signatories). Share the video with your friends and family, screen the video at community events and film festivals! Click here to find out more information about the people behind the video. On April 9, 2013, thousands of people, in 38 communities across Canada, rallied as part of the Day of Action to Stop GM Alfalfa, called for by the National Farmers Union-Ontario. You can view the photo report here. After the Day of Action to Stop GM Alfalfa, the company Forage Genetics International stated that it would not put any GM alfalfa seeds on the market this spring. The company could, however, release GM alfalfa whenever it decides. CBAN is closely monitoring this situation. Before the Federal election in Canada, May 2011: Conservative Members of Parliament purposefully delayed a vote (twice) on a motion for a moratorium on GM alfalfa at Agriculture Committee meetings. The Liberals, NDP and Bloc Members all supported the moratorium so if the Conservatives had allowed the vote, the motion would have been approved and the motion would have passed to the House of Commons for a vote. The motion was proposed by the Liberal members of the House of Commons Agriculture Committee after huge public pressure to support Bill C-474 which would have required an assessment of export market harm before any new GM seed was permitted. The US approved plantings of GM alfalfa in January 2011. In 2007 a judge ruled that the US Department of Agriculture’s (USDA) approval of GM alfalfa was illegal and ordered the Department to conduct an environmental risk assessment to look into farmer concerns about contamination. In December 2009, the USDA released its draft Environmental Impact Statement (EIS) for comment(this is the first time it has conducted this type of analysis for any GM crop). Canadian groups sent in their comments (see above). The commercialization of genetically modified alfalfa — GM Alfalfa — planned by Monsanto and Forage Genetics International, would have a severe, negative impact on Canadian agriculture, markets, and our environment. A united effort by agriculture producer groups, consumer and environmental organizations, as well as concerned individuals, will prevent this from happening. A similar campaign stopped GM wheat in 2004. This is your invitation to join together to put the brakes on GM Alfalfa. We oppose the sale, trade and production of GMO Alfalfa in Canada. We ask the Canadian Food Inspection Agency (CFIA) to reassess its approval for environmental release of GMO Alfalfa. We want the public to understand the hazards, costs and market losses that would result if GMO Alfalfa were released into our environment. Sign the statement here! or email coordinator@cban.ca for more info. See the list of groups that have endorsed the campaign. The Saskatchewan Organic Directorate (SOD) is a Member of CBAN. SOD is the umbrella group for the organic sector in Saskatchewan. In 2001 the Organic Agriculture Protection Fund Committee was established by SOD in order to protect organic farms and food from contamination by GMOs. The OAPF Committee provided support to the legal action against Monsanto and Bayer to bring about an injunction to stop the commercialization of GMO wheat, and to make the biotech companies liable for losses to organic farmers due to contamination of certified organic crops and fields by GMO canola. In 2004 Monsanto withdrew its application to have GMO wheat approved in Canada. You can edit this letter. Dear Minister, I am writing to ask you to remove approval for genetically modified (GM or genetically engineered) alfalfa. I support all the Canadian farmers who are asking you to cancel registration for GM alfalfa, and remove the risk of contamination along with it. Alfalfa is the first perennial crop to be genetically engineered and it could quickly contaminate our fields and food. I look forward to your response to this urgent request.